An exceptionally scarce variant of a cornerstone map of the American west and the finest of its era. National Map of the Territory of the United States from the Mississippi River to the Pacific Ocean. A map of the utmost importance and scarcity, this is William J. Keeler's 1868 pocket map of the American west, considered the 'the largest, finest and most detailed map of the West as it was then known.' The map covers from Detroit and Cincinnati westward to the Pacific and from the Canadian border to the southern tip of Texas, showing in its vastness the great American west with its mineral treasures, American Indian reservations, rivers, mountains, fortifications, and rail lines laid out in spectacular detail. 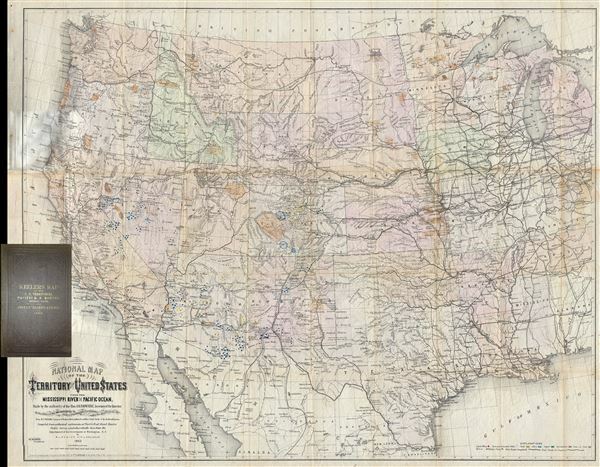 In 1867, seeking to take advantage of public interest in all aspects of the West, but particularly the railroad routes, William J. Keeler, an engineer working in the Indian Bureau, published a large, attractive map of the entire country west of the Mississippi. This is the reduced issue with slightly more coverage in the east and more progressed railroad development. The detail is, of course, less, due to the smaller scale, and the minerals are not colored. Nonetheless it is still an excellent map of the west of its time, and is far more scarce than the larger issue of 1867. All variants of the Keeler map, as suggested by Wheat, offer cartographies of hope in the incredible potential of the American West. The map notes mineral deposits throughout with color coding identifying gold, silver, copper, quicksilver (mercury), iron, and coal discoveries. This incredible mineral wealth, more than any other factor, was driving American interests and commerce ever westward. the only one published which shows the whole of the great Pacific Railroad routes and their projections and branches, together with all other railroads in the States and Territories bordering on the Mississippi on both sides showing at a glance the eastern connections of those Pacific Roads with the existing railroad systems of the country. This is a rare opportunity to own a scarce variant on a cornerstone map of the West. William J. Keeler (fl. c. 1859 - 1869) was an American civil engineer employed with the U.S. Government's Indian Bureau during the second half of the 19th century. He produced one great map, his National Map of The Territory of The United States from the Mississippi River to the Pacific Ocean, which is one of the most important maps of the American west to appear in the 19th century. Otherwise, little is known of his life. Very good. Attached to original binder - discolorations at left center are due to attempting to scan around the binder and are not present on the actual map. Slight wear on original fold lines. Else very clean. Rumsey 4640.001. Wheat, C. I., Mapping of the Transmississippi West, 1540 – 1861, 1170. A catalogue of The Everett D. Graff collection of Western Americana., 2281. Howes, W., U.S.iana (1650-1950): A Selective Bibliography in which are Described 11,620 Uncommon and Siginficant Books Relating to the Continental Portion of the United States, K22. The celebrated collection of Americana formed by the late Thomas Winthrop Streeter, 3077. Schulten, Susan, Mapping the Nation, p. 164. Martin, J., and Martin, R., Maps of Texas and the Southwest, 1513-1900, 47.